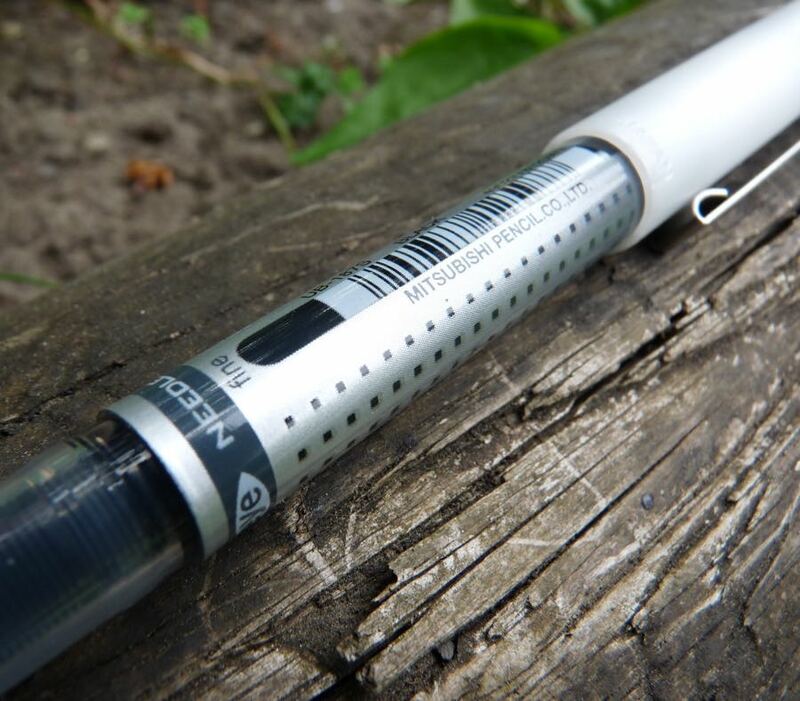 Uni-ball Eye Needlepoint Rollerball Review – Pens! Paper! Pencils! The Uni-Ball Eye Needlepoint is a rollerball (liquid ink) pen with a fine (if indeed a 0.5mm line can be considered fine) tip. It’s available with six different ink colours and costs about £2.50 in the UK. I picked this up as a freebie as part of an order I placed (and paid for) with Cult Pens but it’s easily found in many high street shops here in the UK. I very much enjoy writing with rollerballs. I like how the ink goes down on the paper. 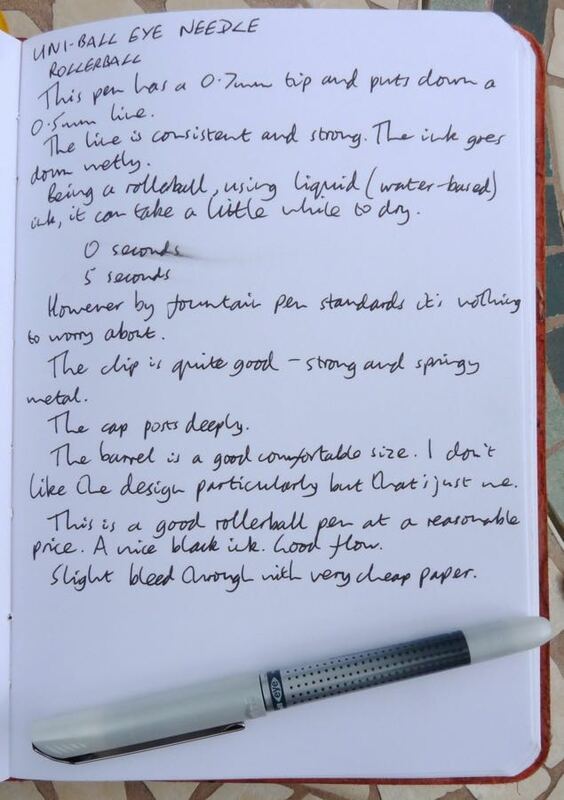 I must admit though that in many respects a liquid ink pen is a hard sell. It doesn’t write well on glossy paper (so isn’t much for birthday cards, for example) and generally, being water-based, isn’t waterproof either. It can feather on cheap paper. Ballpoints solve the first problem and gel ink pens solve the second and both solve the third. It’s hard to make the case for a liquid ink pen over a gel ink pen other than dry times and a personal preference for how it feels to use one: which is lovely. That being said, how does the Eye Needlepoint the perform? It puts down a crisp and consistent line that is fairly well behaved in cheap paper. It’s a very dark black. I don’t think it’s a very fine line. 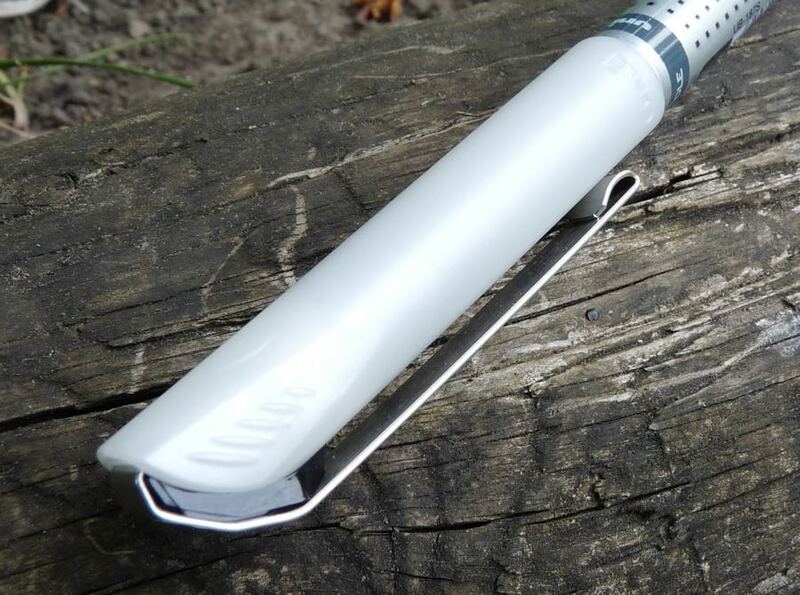 The tip writes smoothly though with just a touch of feedback, which for me is enjoyable. The barrel is a comfortable size when posted and just about okay in my big hands unposted. The clip is fairly sturdy and clippy. I don’t like the design at all. The printing is ugly and the pattern doesn’t appeal to me. I won’t judge you if you love it, though. The Uni-Ball Eye Needlepoint is a good little rollerball pen at a reasonable price. It’s worth picking one up to try. I have the same pen, if I remember correctly it was sent from cult pens free with an order. I too don’t care for the design and the feel of the pen is cheap however I appreciate the metal clip. I have used it with Rhodia R paper and find it pretty good but with Moleskine and Filofax paper it feathers and bleeds through. Funnily enough, my first go with this pen was courtesy of Cult Pens as a freebie. It’s not a pen that solves any pen/paper interaction issue (and is definitely not suitable for shiney birthday cards). 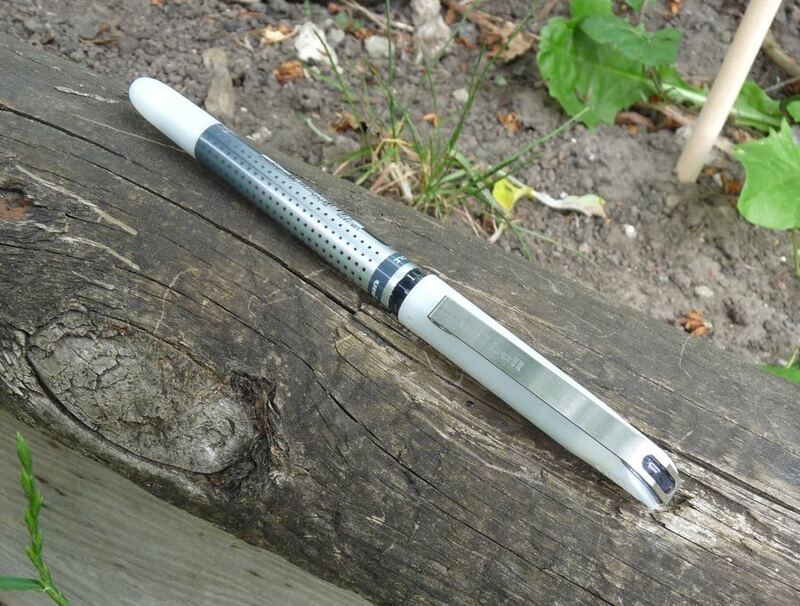 But it is nice to use, which is a good part of the pen-collecting thing. Do you absolutely need more than 80gsm general purpose paper and a bic? Often no. But definitely not the point. 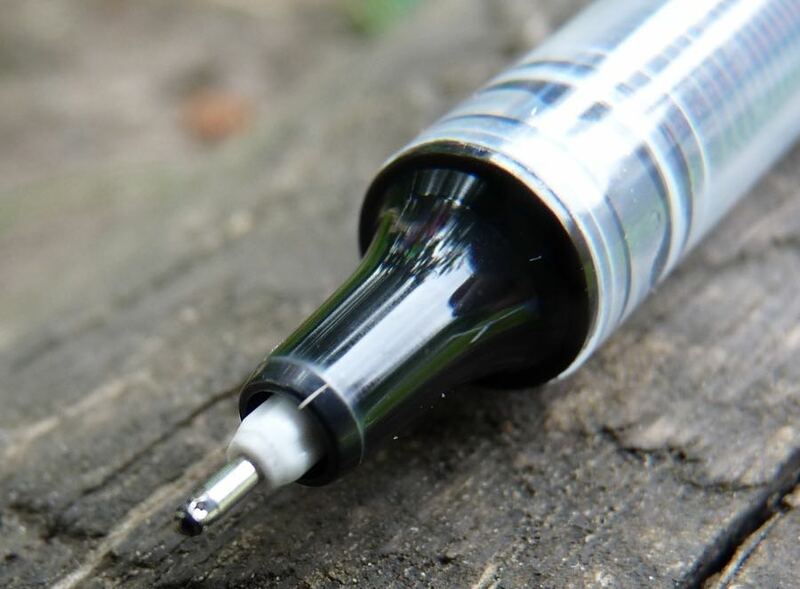 Of perhaps some interest is the uni-ball R301, I think being discontinued unfortunately, which is a similar concept, but stainless steel, and if anything even nicer to write with (as well as being fine tipped).